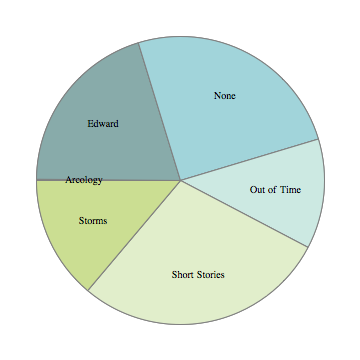 Back in 2010 I started logging all of my writing time, which means now I can have nifty pie charts. So here is 2013, in charts. I spent big chunks of time on three different books, and a bunch of short stories. 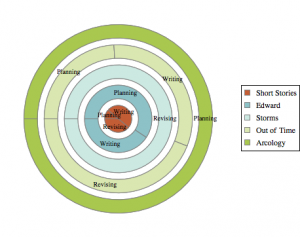 While I got a lot done, it sometimes didn’t feel like I was making progress because my time was split up a lot more. I knew that already, but it’s nice to see my impression confirmed. There were good reasons for my jumping around, but I don’t want to start any more novels until two of these are done. Some notes: These titles bear little resemblance to what the books will actually be called. 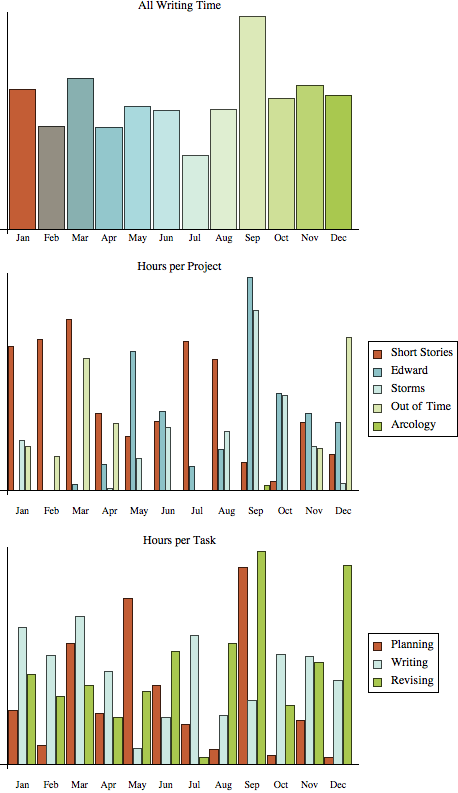 About 2/3 of my logged time was spent actually working on projects. The rest includes things like critiquing, sending stories out, writing classes or books about writing, and reading slush, most of which falls under the “None” project. 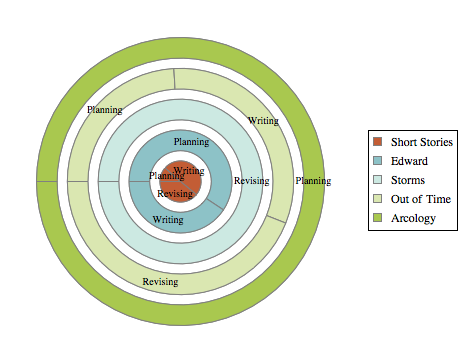 I’m happy to see a large proportion of actual writing time on most projects, since that’s the fun part of the work. Between parts of two novels and several short stories, I wrote more than 100,000 words last year. 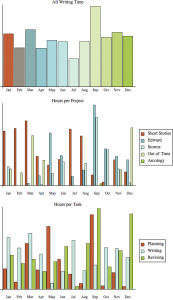 This would be a fun chart to do for a single project or set of projects over multiple years. That dip in July is from my two-week vacation. The spike in September is a combination of two deadlines: the Strange Chemistry open submission and a novel contest on the Codex writers forum (careful inspection of November and December will tell you that I changed my mind about which novel to enter in the contest). And despite my comment at the beginning of this post, although I worked on three different books, I mostly didn’t work on all of them at once. The only project I worked on in all 12 months of 2013 was my catch-all “short story” project (and no, it was not the same story all year).